The small settlement Sunny Valley is located in the southeast of Crimea at the foot of the Meganom Mountain. Some modern and comfortable cottages are within 1 km from wide sandy and shingle beach. Many guests come there every year to spend the vacation at that picturesque seaside. 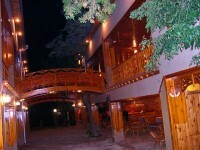 At the foot of the medieval Genoese fortress on the outskirts of Sudak is located the private summer hostel "Izmir". 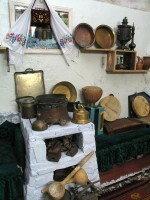 Recently there opened a small Crimean Tatar ethnographic museum. 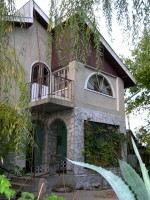 In the newly built one-storied cottage there are well-furnished en-suite that ensure the guests every comfort. The beach is only 25 m away from the pension.